Maybe two years ago, my sister and I came up with what we thought was a genius term for a photo that someone snapped of themselves on their cameraphone: an “extended arm shot.” Someone else, however, came up with a term that rolled far more easily off the tongue: the “selfie.” The rest is history. Who hasn’t, at some point in time, either made up a word or repeated one they heard dreamed up by someone else? 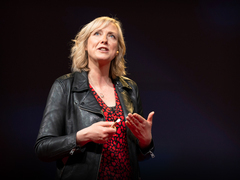 In her TED Talk, Anne Curzan — an English language historian — takes a look at new words like “hangry” and “adorkable,” and shows how colloquial terms like these get sealed in dictionaries. And while some lament these types of words as the death of a language, Curzan says they reveal that a language is living, breathing, and growing. Below, take a look at the nominated words from just the past four years. They really do tell a historical story, revealing the rapid pace at which technology is changing, shifting attitudes in the political arena, even emerging values. They show new philosophies and ways of thinking about business, the economy, identity and what it means to live a good life. Some of the words already feel dated; others seem so standard that it’s hard to believe they ever felt new. 2013 Word of the Year: because (“used to introduce a noun, adjective, or other part of speech e.g. ‘because reasons,’ ‘because awesome’”). 2012 Word of the Year: hashtag. Other nominees: marriage equality, YOLO, 47 percent (“the portion of the population that does not pay federal income tax 31”), fiscal cliff, Gangnam style. 2011 Word of the Year: occupy (“verb, noun, and combining form referring to the Occupy protest movement”). Other nominees: FOMO (“Fear of Missing Out”), the 99%, humblebrag, job creator. 2010 Word of the Year: app. Our colloquialisms evolve at a rapid clip, telling the story of our unique moment in time and place in culture. And here’s a startling idea: 100 years from now — if ‘selfie’ sticks, it might just sound formal to a new generation of listeners. Who will have their own new words.